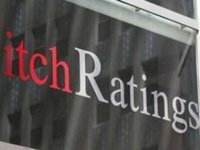 Fitch Ratings has affirmed the ratings of JSC State Savings Bank of Ukraine (Oschadbank) and JSC The State Export-Import Bank of Ukraine (Ukreximbank), including their 'B-' Long-Term Foreign and Local Currency Issuer Default Ratings (IDRs) with Stable Outlook, Fitch has said in its press release. "The affirmation of the ratings reflects limited changes to these banks' standalone credit profiles and Fitch's view of potential support to these institutions, if required, from the government of Ukraine (B-/Stable)," Fitch said. The banks' Long-Term IDRs are underpinned by each of the banks' 'b-' Viability Ratings (VRs) and, simultaneously, continue to be aligned with their 'B-' Support Rating Floors (SRFs). Their National Long-Term Ratings of 'AA(ukr)' are mapped to their 'B-' Long-Term Local Currency IDRs. Oschadbank was founded in 1991 and Ukreximbank in 1992. Its sole owner is the state. Oschadbank ranked second among 84 operating banks as of January 1, 2018 in terms of total assets worth UAH 234.241 billion and Ukreximbank third with UAH 171.011 billion, according to the National Bank of Ukraine.